Please read this article and post any questions you have in the comment are below. Reviews and articles are posted from our experience as contractors who specialize in exterior wood restoration. We are experienced in the trade of prepping and applying a stain to an exterior deck. 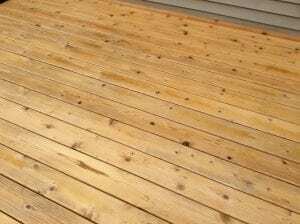 The stains are tested on actual decks with normal exposure to weather and traffic. Consumers use a test on an individual board that sees no traffic or use. This board is not exposed to normal everyday “real world” conditions. We test all available brands and versions. Consumers test mainly big box store brands such as Behr, Sherwin William, Cabots, etc. Many of the best wood stains are not available at these stores but rather in high-end paint stores, lumber yards, or online. Behr Deckover, Olympic Rescue-It, Rust-Oleum Deck Restore – Do They Work? Update 2019 on Behr Deckover, Olympic Rescue-It, Rust-Oleum Deck Restore – Do They Work? We would love to hear from you if you have used the Behr Deckover, Rust-oleum Deck Restore Olympic Rescue-it or any other Deck Resurface type stains. If you have any pictures of your experience with the Deck Resurface Stains, you can add them in the comment area with a detailed description of the product brand and your experience. If selecting a Deck Resurface Stain, keep in mind that most users have had a bad experience with products from Home Depot and Lowes. While the majority of comments and user experiences reported are negative, the Gulf Synthetics Deck Revive has been favorable. 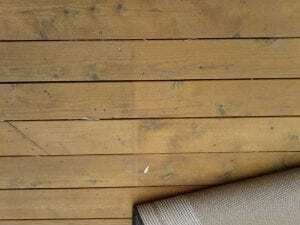 Deck Resurface Stains like Behr Deckover, Olympic Rescue-It, Rust-Oleum Restore – Do They Work? Homeowners are always looking for an alternative to a deck replacement. When wood is neglected, it can be expensive to have it restored or replaced. A few companies like Behr, Rust-Oleum, and Olympic to name a few, are selling a deck resurface product. They claim it is the smart alternative to deck replacement. It can be applied to wood surfaces such as decks, stairs, docks, composite decking, and more. So is it a good alternative or is it just a waste of time and money? Deck Resurface products are basically similar to extremely thick paint. 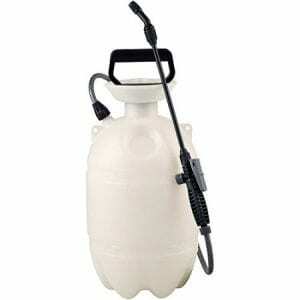 They are designed to mask the wood and fill large cracks or voids. Deck resurfacer coatings will not show any wood grain. Please note that this product is far beyond conventional wood restoration. We appreciate your input. 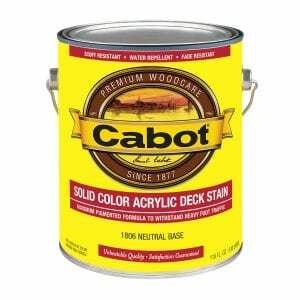 If you have used the Cabot Solid Color Deck stains, feel free to leave a comment below and pictures of your completed projects. Summary: Cabot® Solid Color Decking Stains are extremely durable exterior stains for use on all wood decking, outdoor furniture, and fencing, as well as cement patios and walkways. Series #1800, 100% acrylic finish is also water repellent and fade resistant. Oil Series #1600 and #7600 contain all-natural pigment with 100% alkyd resin. Solid Color Stains provide excellent adhesion to new, previously stained or painted surfaces, which are in a clean, sound condition. Solid Color Decking Stains are ideal for use on most types of lumber including redwood, cypress, pine, and fir, as well as pressure-treated wood. – The two coats of Cabot Solid Deck Stain applied to our deck wood covered evenly and did not show any wood grain which is expected with a solid stain. Update for 2019: This is our initial Review of the Sherwin Williams SuperDeck Solid Color Wood and Deck Stain. This review will be updated through the years. We appreciate your input. If you have used the SW SuperDeck Solid Color Deck stains, feel free to leave a comment below and pictures of your completed projects. Summary: SuperDeck Solid Color Stain provides durable, opaque protection for many exterior horizontal wood surfaces. Featuring Cool Feel™ Color Technology helps reduce the surface temperature by up to 20°F when compared to conventional color technology. 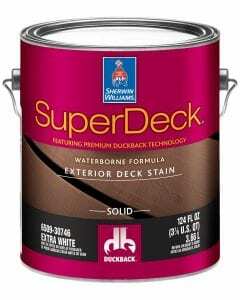 – The SuperDeck Solid Color Stain was applied with an airless sprayer, roller, and brush. The two coats applied to our decking wood had no issues with appearance when finally finished. 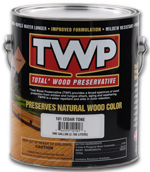 TWP 200 Series is a semi-transparent oil based penetrating finish designed to extend the life of exterior wood such as decking, cedar shake siding, and shingles. Containing a paraffin oil, TWP 200 series penetrates wood extremely well. The Paraffin oil is a “non-drying” oil that enhances the wood cells structural stability. This greatly improves the woods life and appearance. The penetrative portion of the product absorbs into aged and porous wood, adding bulk to aged and brittle wood fiber. This restores lubricity and flexibility to brittle shingles. The TWP 200 Series complies with all current Canada, US federal and state VOC (volatile organic compounds) regulations. The TWP 200 Series was designed for shakes and shingles but can be used for all exterior wood surfaces such as decking, fencing, log homes, cedar-framed homes, etc. – We have only used the TWP 200 Series a handful of times through the years. It is an excellent stain and on par with the TWP 100 and 1500 Series. In some ways, it is even better with UV protection than the other two. The main reason we have not used it more is due to the final color curing. This can take up to a month to reach final color but usually only takes a week or two. The product goes on darker than the color swatches but always cures and lightens to the correct color. It just takes time, so if you use the TWP 200 Series, you will need some patience. After the product reaches it’s final cured color, it is a very rich color that highlights the natural tones of the wood. It does not mask or hide the grain at all. – The 200 Series has excellent UV protection. Very little color fading after 2 years. We attached a picture of the 200 Series at the 1-year mark. This shows an outdoor rug that had not moved for 1 year. There was little to no color fading when the rug was pulled back. – The 200 is a paraffinic oil which means it is a non-drying oil. Paraffinic oils will dive deep into the wood grain so they are not prone to peeling or wearing. The PPG Timeless Deck Stain was introduced last year into Home Depot. The product is actually the exact same thing as the Olympic Elite Wood Stain, just relabeled for Home Depots use. The review below is a repeat of our testings of the Olympic version. PPG Timeless Advanced Stain + Sealant in One is a deck and wood stain that is ideal for bringing the rich look of interior wood to exterior wood surfaces such as decks, doors, furniture, and trim. Delivering more pronounced color while still enabling wood grain and texture to show, it provides luxurious appeal with a beautiful satin sheen finish. Formulated with both stain and sealant combined, this protective coating offers lasting defense against UV damage, mold, mildew, warping, cracking and more, helping retain your wood’s natural beauty over time. 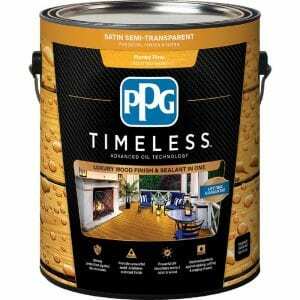 – PPG Timeless Stain is an oil-based stain + sealer in one. We used the Chestnut Brown color. The appearance of the final stain finish was a brown color that did not seem to enhance the beauty of the wood as well as we had expected. However, the PPG Timeless Wood Stain did penetrate the wood fairly well and did not form a film on top. –At the 2-year test mark, PPG Timeless did hold up pretty decent with an estimated 70% color retention. Some fading and graying were noticed in traffic areas. Welcome to Deckstainhelp.com, your number one source for deck staining tips and latest industry news on the internet. 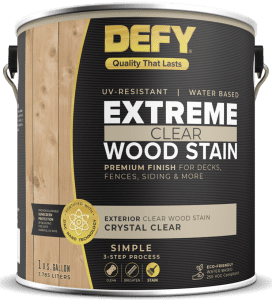 This year in 2019, Defy Extreme Clear Wood Stain continues to be the leading clear wood stain on the market. Feel free to leave a comment if you’ve used Defy Extreme Clear Wood Stain yourself. 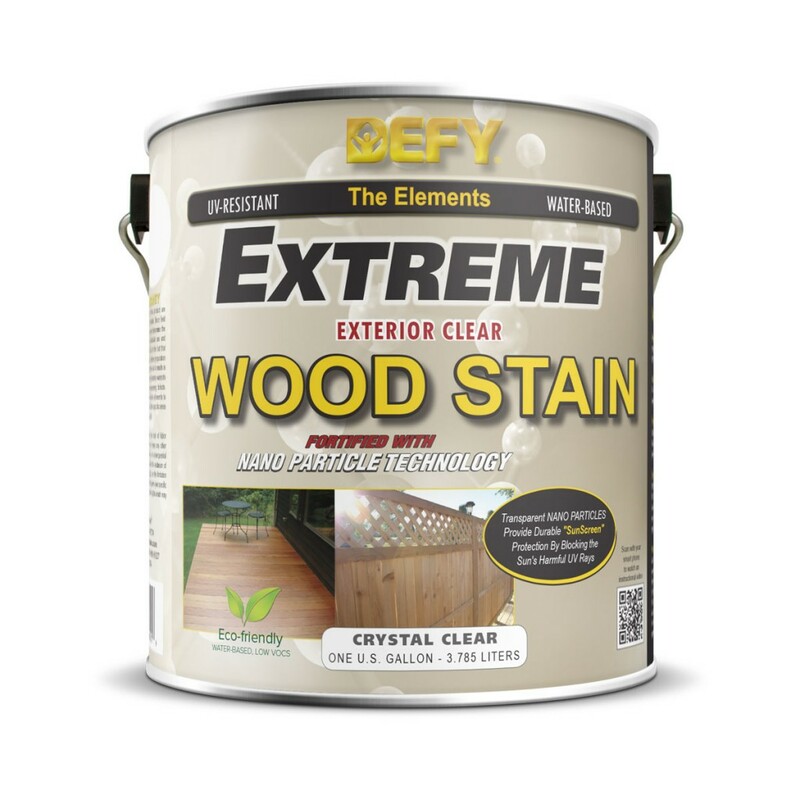 Defy Extreme Clear Wood Stain is the leading “crystal clear” deck stain finish on the market today. Defy Extreme Clear uses light stabilizing nano particles of zinc oxide, which is the same product used in sunscreen. The zinc oxide particles reflect and filter UV radiation to help eliminate wood discoloring, graying and fading. Our field test of Defy Extreme Clear Stain was on a wooden fence. A deck surface may have slightly different results. *Important: Defy Extreme Clear is an untinted version of the Defy Extreme Stain. Customarily clear wood stains lack sun blocking pigments and do not prevent UV graying as well as tinted wood stains. – The wood appearance was not altered after the Defy Extreme Clear finish dried. The stain applies to the wood a milky white color but dries clear without altering or enhancing the wood’s appearance. Defy Extreme Clear also does not film on top of the wood. –At our usual 2-year test mark the wood deck we coated had retained 30% of the original natural wood color. There was graying on the southern exposed areas. We suggest using Defy Extreme Stain if improved UV protection is wanted or reapply the Extreme Clear annually. –Defy Clear Stain showed zero signs of wear on the vertical surface of the deck surface. –It took 5 gallons of Defy Extreme Clear Wood Stain to apply 2 coats to our 500 square foot test deck. With Defy Extreme Clear costing $44 a gallon on average, the cost of our test was slightly high. – No mold or mildew was growing on or in the Defy Extreme Clear. Defy Extreme Clear deservingly scored high here due to no signs of fungal growth on or in the stain finish. This was pleasing compared to other stains we have tested. –Defy Extreme Clear Wood Stain is very thin almost like water and applied well using an airless sprayer. The initial coat penetrated almost immediately upon application while the following coat took slightly longer. We did have to back brush a few drips here and there but we did not notice any overlap marks anywhere. –At our 2-year check of the stain’s color, no visible darkening was present. –For maintenance of Defy Extreme Stain, we suggest a thorough cleaning using a wood cleaner to remove any graying followed by an application of wood brightener to lighten the wood up even more. There is no need to use a stain stripper with Defy Clear because the fading was even and no heavy peeling was apparent. –Defy Extreme Clear Wood Stain is a good choice for those wanting a natural wood appearance. It is clear however that Defy Extreme Stain in one of the colored tints seems to prevent UV fading and graying 2 to 3 times longer than Defy Clear. Nevertheless, if you are in the market for a crystal clear wood stain that you do not mind recoating every 12-18 months then Defy Extreme Clear Stain is a great product in our opinion. UV Exposure: 50% Full Sun, 50% Shade. South facing. In reviewing some of the top stains on the market for 2019 we could not overlook TWP stain. It is a registered EPA wood preservative that offers excellent protection from UV graying, wood decay and water infiltration. TWP uses select mildewcides that naturally resist fungal growth to help eliminate wood rot. The semi-transparent oil based formula penetrates deeply into wood pores without extreme surface film accumulation. It emphasizes and enhances existing wood grain beauty with color depth and warmth. 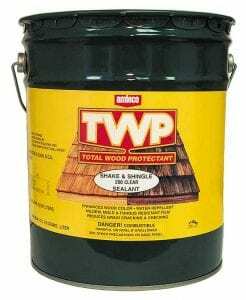 Our TWP Stain review 2019 shows that this stain goes beyond the TWP claims of being a number one wood preservative. Top contractors and professionals prefer wood stains that penetrate into the wood surface and can be easily maintained and reapplied without sanding. This makes wood maintenance easier, cheaper, more effective and less frequent. Most TWP stained surfaces will last 2-3 years before a recoat is needed. The excellent UV-absorbing pigments eliminate wood discoloring and graying, which is a common problem with exterior wood surfaces. Welcome to Deckstainhelp.com, your number one source for deck staining tips and latest industry news on the internet in 2019. Ready Seal Wood and Deck Stain continues to follow same premature fading patterns as years before. Leave us a comment if you’ve used Ready Seal Wood and Deck Stain. 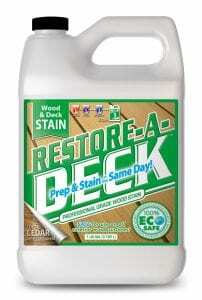 Ready Seal® Wood Stain is considered a professional grade exterior wood stain. Ready Seal Wood and Deck Stain is suggested for use on all exterior wood surfaces such as decks, fences, arbors, gazebos, wood siding, roofs, and log homes. 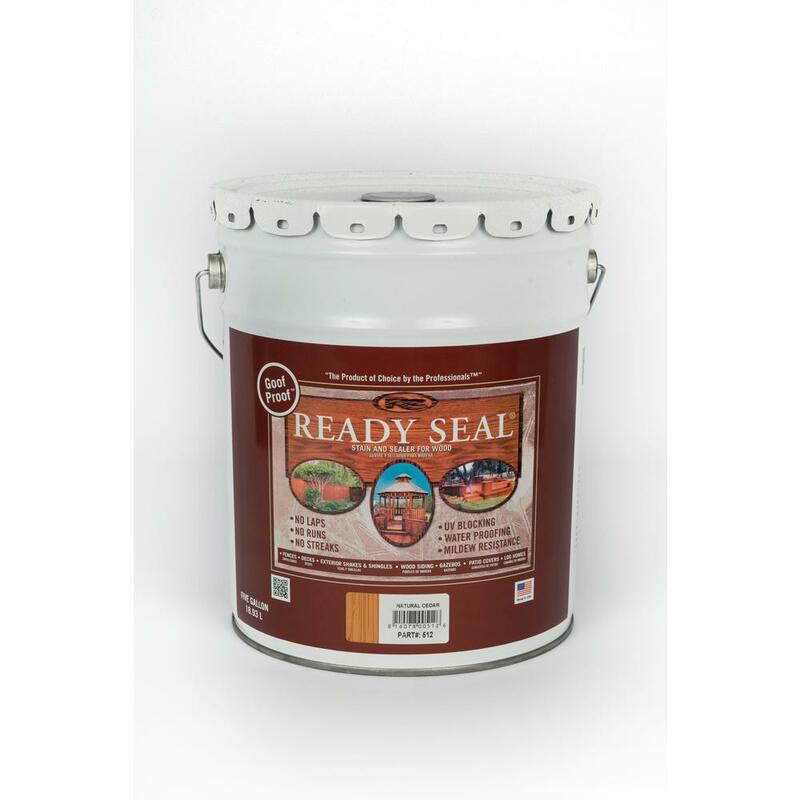 Ready Seal was originally designed for contractors but is now available to homeowners through some Home Depot stores in the southern part of the country. Ready Seal Stain is a drip and run free resulting in an even finish. The formula is a special blend of paraffin oil, resins, trans-oxide pigments, and algaecides. – Ready Seal lived up to their claim and resulted in a nice even finish. The cedar deck we tested definitely looked more enhanced with the Natural Cedar color we applied. With that said, the color did fade quite a bit after several days as the paraffin oils continue to penetrate into the wood grain. We also do not like how the finish stays oily for several days after application or until it fully penetrates into the wood grain. – At our 2-year test mark, there was about 50% color retention.